For the past 60 years, Osram-Sylvania, has been a major innovator and supplier of powder technology, high temperature metallurgy and inorganic chemistry used in the manufacture of lighting products, automotive and electronic parts and defense systems. Their largest factory, the Towanda, Pennsylvania plant, sits on 65 acres deep in the region of the Keystone State known as the Endless Mountains, along the shores of the Susquehanna River. The Towanda plant processes tungsten minerals and molybdenum (stranded wire) materials, which are critical components in everything from the filament wires found in the light bulbs we need to light our homes and electron emitters for defense system electronic devices to amour piercing bullets, rocket-engine nozzles and other high temperature jet engine components for military and aerospace applications. The process for tungsten begins with milling crushed ore powder and continues through wire drawing and high temperature metallurgy. Industrial processing plants run process cooling towers 24/7, as a relatively inexpensive and dependable means of removing heat from cooling water used to supply cool air for facility occupants and equipment. Additional towers cool the circulating water used in high temperature metallurgy processing methods. Although the Thermal Care FC series tower is designed for outdoor use in industrial manufacturing locations, the equipment at the Osram-Sylvania plant was having issues with large concentrations of contamination and debris fouling the closed loop recirculation system. 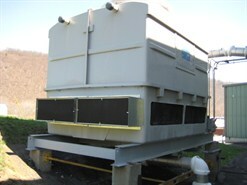 The unit utilizes a closed loop system, mixing air and water, which allows contaminants to transfer to the inline filtration system. Naturally occurring environmental elements like cottonwood seeds and bugs, plus process occurring debris like metallic dust was frequently blocking the inline filtration system, causing an automatic shut -down of the whole processing system. Maintenance personnel were being called out daily to take the system apart, and clean the strainers. EM Cahill Company, a sales agency headquartered in Syracuse, New York, has been servicing commercial and industrial accounts like Osram-Sylvania since 1991. Their goal is to help customers contain costs through filter standardization, reducing man hours, and improving ventilation efficiency through preventative maintenance and customized filtration programs that promote good HVACR system hygiene. Prior to speaking with EM Cahill, Gary Wilcox, Production Supervisor for Osram-Sylvania was considering a costly chemical additive to the loop to help break down the contaminants and prevent them from plugging the in-line strainer. This option presented a high reoccurring consumable expense and potential environmental issues. Along with the environmental and health/safety issues being affected by discharge water into sewer systems, can come costly and frustrating red tape that can occur when dealing with government regulatory agencies. After a site evaluation and a few simple measurements, EM Cahill recommended affixing Permatron’s unique and cleanable PreVent® Equipment Protection Filters to the multiple air inlet louvers as a low cost solution to their problem. According to Mike Cahill, the nominal cost of the media and the ease of installation will pay for itself many times over through greatly reduced maintenance cost and process up time. The durable PreVent® filter can be used outdoors, year-round, and is easily mounted on equipment by in-house maintenance staff using a variety of unique attachments. Installation of these filters needed to take into account that process cooling cycles include continuous water trickling down within the tower, close to the air intake louvers. Throughout sub-zero, chilly Northeastern winters icing can occur causing air flow blockage. 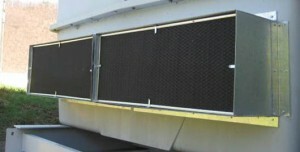 EM Cahill developed a simple steel air intake screen holding frame holding frame system that is designed to position the filters away from the area where the freezing water can occur. PreVent® Equipment Protection Filters have the option of being finished with a flexible vinyl edge or a rigid steel frame. After six months of use, thermal care cooling tower air intake cottonwood filter screenthe processing staff and the maintenance staff are very happy with the air intake filtration solution. The cooling tower system is not automatically shutting down costly operations, and maintenance has been reduced to simply brushing the debris off the filter with a broom, without any system downtime.